Capitol Hill apparently can’t get enough of Paul Manafort this week. 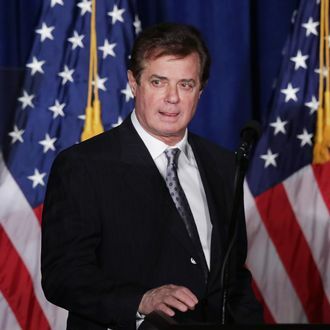 The former Trump campaign chair spoke Tuesday with staffers on the Senate Intelligence Committee and answered questions about that June 2016 Trump Tower meeting with a Russian lawyer — and reportedly turned over notes he took during that now-infamous sitdown. The Senate Judiciary Committee, which is conducting its own investigation into possible Trump-Russia ties, also wanted to hear from Manafort — and went to so far as to issue a subpoena to get him there to testify in an open hearing on Wednesday. But the possibility of Manafort appearing in an open session didn’t last long. The New York Times reports that the Judiciary committee has now dropped the subpoena, and Manafort won’t publicly testify this week. A spokesman for Manafort, Jason Maloni, said that his client had been “cooperative from the beginning, and we are confident we can work something out” — which seems to be exactly how things have played out. The Senate Judiciary Committee hasn’t said how Manafort will be interviewed by its members — though it’s still been a busy week for him and all those Trump campaign officials who attended that 2016 meeting. Jared Kushner testified privately to the Senate Intel Committee on Monday, and returned Tuesday to the Hill for a meeting with the House Intelligence Committee. The Senate Judiciary Committee also wanted Donald Trump Jr. to testify publicly at Wednesday’s hearing, but instead will talk to the president’s eldest son behind closed doors.